Téléchargez notre brochure ou consultez-le en ligne. Since its opening as Macdonald College in 1907, McGill’s Faculty of Agricultural and Environmental Sciences has been at the forefront of education and research in agricultural and life sciences as well as engineering and environmental disciplines. The old stone dairy barn situated on the Macdonald Campus Farm is a symbol of this history of inspired teaching and world-changing research - it is an integral part of what is today the only operating dairy farm remaining on the island of Montreal. 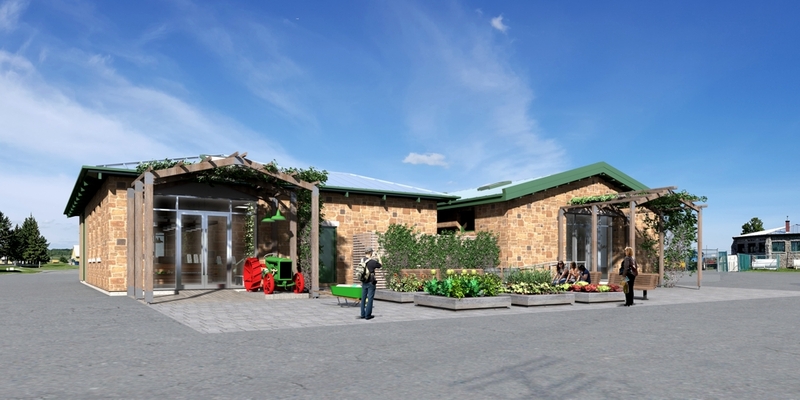 As home to the new Macdonald Farm Community Engagement Centre, it will introduce new generations to the past, the present and the future of sustainable food production and environmental stewardship. We have a responsibility to educate people on how their food is produced, and over the last decade our campus outreach programs have engaged approximately 6000 elementary and secondary school students annually. Due to ever-increasing demand, we require a dedicated space in order to host more visitors and develop our programs further. 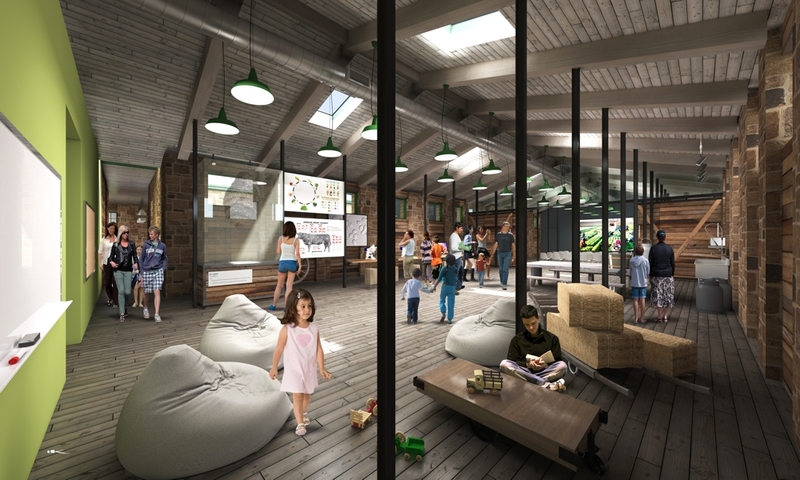 The new $4-million dollar Macdonald Farm Community Engagement Centre will multiply the farm’s capacity to receive visitors by providing a suitable venue for flexible use, available all year round, and will offer hands-on educational activities and programs to inspire young minds. Conceptual rendition of the Lorna K. and J. William Ritchie Educational Hall Conceptual rendition of the Alton and Murray McEwen Visitor HubThe Community Engagement Centre, with the 3000 square foot Lorna K. and J. William Ritchie Educational Hall (also see video) and the Alton and Murray McEwen Visitor Hub, will serve as home base for educational tours of the farm, including the dairy barn, the new calf barn, and the mini-farm, offering visitors an experience that is both fun and informative. The Centre will host 4-H groups and summer camps for youngsters, and is a unique and engaging venue for speaker series and events, special weekend events for the general public, continuing education workshops and seminars, and industry meetings, conferences and receptions, and will serve as a resource for students across McGill as well as other universities and CEGEPS. Working with educational consultants and on-campus partners such as McGill’s Faculty of Education, the Morgan Arboretum and the Lyman Entomological Museum, the Community Engagement Centre team is developing a suite of workshops and labs which connect to the elementary and secondary school curriculum and align with Ministry of Education criteria for science education. These will introduce students to some of today’s complex global issues and challenges, encouraging them to develop an interest in agricultural and environmental sciences. The Centre will combine tangible, hands-on learning activities with interactive digital tools to offer a comprehensive learning environment. 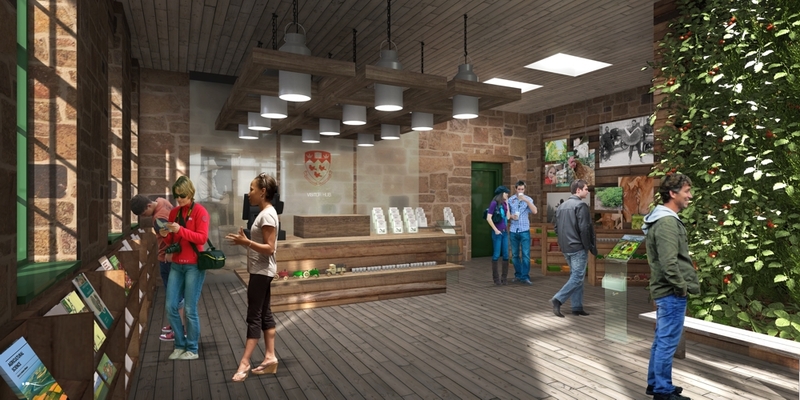 It will also feature exhibits, designed in collaboration with our colleagues at McGill and with industry partners, on everything from animal welfare to water resource management to contemporary cheese production. The Macdonald Farm Community Engagement Centre forms a unique resource for sharing knowledge about agricultural and environmental sciences with a broader public, and promises to play an important role in attracting the next generation of students and potential researchers in this domain. With your support, we can help thousands of students and community members discover the importance of education and research in agricultural and environmental sciences. We are inviting friends and alumni to support the project and give generously to build on the legacy of the Farm for generations to come. download our brochure, or view it online. Paul Meldrum | paul.meldrum [at] mcgill.ca | 514-398-8663.